"If we take these steps together we can save the lives of countless people in all corners of the world," Trump said during brief remarks to representatives from 130 countries. "All of us must work together to dismantle drug production and defeat drug addiction." Trump did not discuss specific actions he wanted other countries to take. The U.S. is dealing with an opioid crisis that the Centers for Disease Control and Prevention says claimed a staggering 72,000 lives last year. 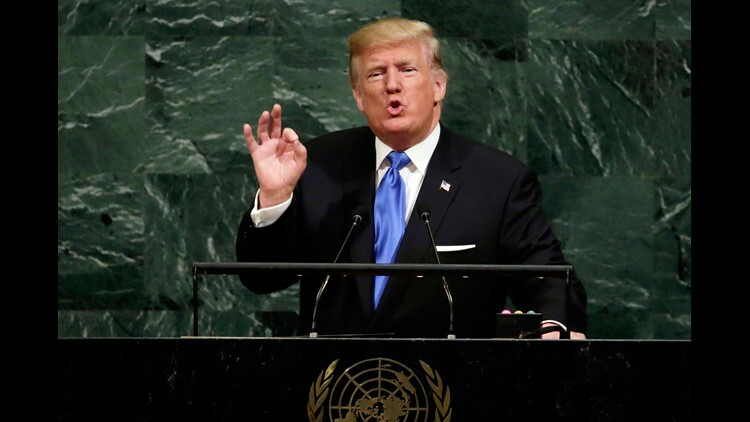 Trump will deliver several addresses during the 73rd meeting of the United Nations General Assembly this week, including a speech on sovereignty on Tuesday and one on Iran at the United Nations Security Council a day later. The president, who has been critical of the U.N. in the past, offered mild praise for it on Monday. "The United Nations has plenty of potential and that potential is being met," said Trump, who then added: "Slowly but surely." Critics said Trump’s speech at the U.N. on the global drug problem was nothing more than a splashy "photo-op” aimed at making him look like a global leader on the issue, even as America’s opioid crisis continues unabated. Hetzer said the one-page “call to action” put forward by the Trump administration at Monday’s U.N. meeting will not have any real impact. The document does not mandate any specific action. It calls on world leaders to “reaffirm” their commitment to combating the global drug scourge by reducing demand and increasing interdiction, among other steps. There’s no question that drug addiction and cultivation are a global problem, fostering corruption, violence and terrorism across the world. But there’s also no question that the current U.S. opioid epidemic is an unparalleled domestic crisis for Trump. The 2018 World Drug Report, which Trump cited in his remarks, notes that drug overdose deaths helped to drive a drop in life expectancy in the U.S. in 2015 and 2016, the first such drop in a half century. In 2016, 63,632 people died from a drug overdose in the United States, the highest number on record and a 21 percent increase from the previous year, the report notes—a spike fueled in large part by fentanyl, a super potent synthetic opioid.